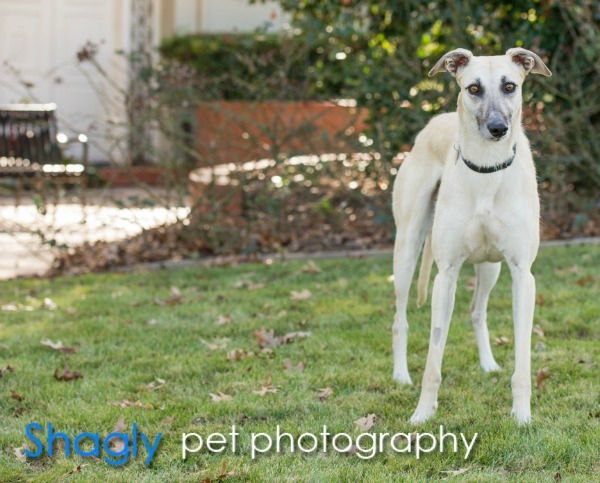 Zoey is a fawn greyhound/staghound female who was surrendered by a coyote hunter in Kansas. She is estimated to be about a year and a half old. Zoey has passed an initial cat test. Zoey has never met a dog she doesn't like, or get along with. She is the most laid back girl we've ever met. With other dogs, she'll play, romp, sleep, share a bowl, let them walk on her and over her and never complain. Zoey also has superb leash manners and rides extremely comfortably in a car. Zoey begins her relationship with people a little on the tentative side, but she quickly warms and becomes your Velcro best friend. Zoey loves to snuggle, keep you company in the bathroom, and give you kissing face baths. Zoey does get spooked and concerned with unfamiliar and loud noises. Zoey will let you know with one or two words that she wants to go out or come in. Actually, she is not fond of closed doors if you are behind one. She'll use her "open this door" word to let you know that she'd really prefer to be with you. Other than that, she is her relaxed, happy, loving self. Zoey is a staghound, part greyhound and part deerhound. The deerhound part appears to be just a strip of longer wiry hair along the top of her back. The rest of her is soft and sleek. Of course, she is also a stunning very light fawn, with the biggest eyes and best eye makeup in the canine world. We like to think of her as Cleopatra. If she were a boy, we'd be naming her Zorro. As this is being written, Zoey is in her familiar position with people as close as possible, this time touching the chair, next to my feet. Zoey is especially remarkable for how easy going she is. 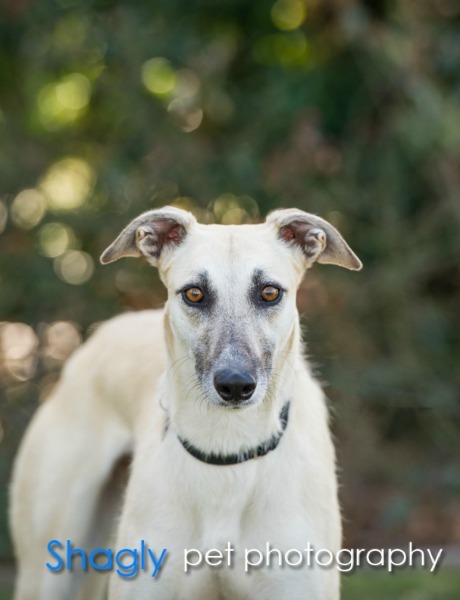 She would be an ideal dog as a first dog for a family, or in a home with other hounds. See? Easy and relaxed, loving, cuddly and snuggly. As if all this lovely gentleness and acceptance weren't enough, Zoey has a couple of those totally endearing traits that are the things you'll be telling every one whether they ask or not. When Zoey gets excited, she bounces on her front legs. And, when she gets very happy, she laughs—her piggy snort laugh. That one is guaranteed to produce a laugh in you too.